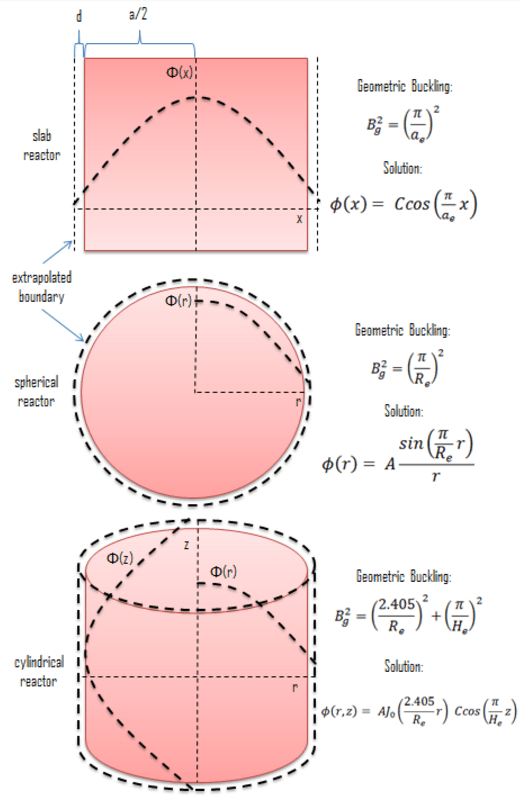 The quantity Bg2 is called the geometrical buckling of the reactor and depends only on the geometry. This term is derived from the notion that the neutron flux distribution is somehow ‘‘buckled’’ in a homogeneous finite reactor. It can be derived the geometrical buckling is the negative relative curvature of the neutron flux (Bg2 = ∇2Ф(x) / Ф(x)). In a small reactor the neutron flux have more concave downward or ‘‘buckled’’ curvature (higher Bg2) than in a large one. keff < 1. This condition is known as the subcritical state. keff = 1. This condition is known as the critical state. keff > 1. This condition is known as the supercritical state. Bm < Bg. When a reactor is smaller (i.e. higher Bg and higher relative curveture) than the critical size for a given material, Bm < Bg, then the reactor is subcritical. Bm = Bg. 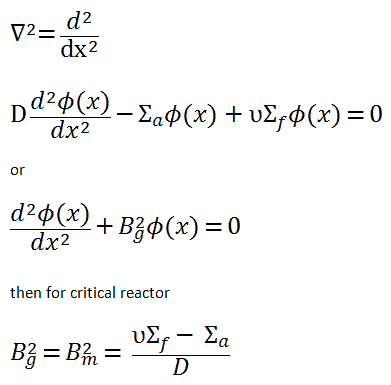 When a reactor size matches the critical size for a given material, Bm = Bg, then the reactor is critical. Bm > Bg. 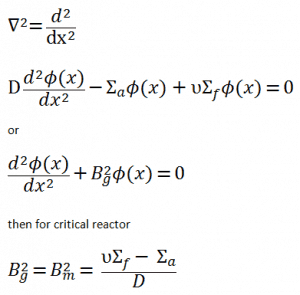 When a reactor is larger than the critical size for a given material, Bm > Bg, then the reactor is supercritical. where M2 is the migration area and the subscript is dropped from B, the geometric buckling. As can be seen the total non-leakage probability of large reactors is primarily a function of migration area and the relative curvature of the neutron flux given by the geometrical buckling. Calculate the critical radius (Bm = Bg) using one-group diffusion theory. From this equation we can get Re= 30.5 cm.